The Weston Creek Cricket Club had its beginnings on the 20th. September 1972 at a public meeting convened by Don Brooker at Rivett Primary School. This meeting resulted from a gathering of boys and their parents at Waramanga Oval on the previous Sunday, who had responded to an advertisement by the A.C.T. Cricket Association in the Canberra Times. Keith Simmons, Goerge Gibbs, Alby Smart, Graham Arthur, Ray Perks, Phil Chapman, Ray Stevenson, Frank Lonie, "Jesse" James, Tom Murphy, Don McLeod, and Bill Hill. Nine teams were entered in the junior competitions in the 1972 - 1973 season with some 120 boys registered as members of the club.Although none of the teams met with any outstanding success it was a most satisfactory first season in every way. All teams were fully equipped with new kits,although the club had to go into debt to the extent of $1236.00. With the assistance of a dedicated group of workers including Bill Hill, Tony Perriman and "Jesse" James this deficit was turned into a credit balance of $179.02 by the end of the season. During the next two seasons the club continued to make progress both in the number of teams and in the standard of play. Season 1973 - 1974 saw the club's first premierships when the Under 11 and Under 12 teams won their finals. The standard of play in the junior teams is now well established with the majority of teams making the semi-final rounds each season. When the Sub - District Competition was introduced for senior players in 1975 the nature of the club changed. At a meeting on the 18th. September 1975 at Weston Primary School it was resolved to drop 'Junior' from the Club's name to become The Weston Creek Cricket Club and it was also decided to enter two teams in the Sub - District Competition. Prominent amoung those who helped to organise the first senior teams were Chris Harris, Jim Nuttall, Dave Faulkner and Ian Phillips. Not withstanding the achievements of the past five seasons, 1977 - 1978 will stand out as one of great significance in the history of cricket in Weston Creek. 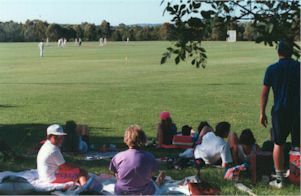 Not only has the Club a record number of teams, four senior and fifteen junior,representing it in various comptitions,but the aquisition of Stirling Oval as a home ground has fulfilled the hopes of those who worked tirelessly to develop and foster cricket at all levels in the Weston Creek district. The Club and the area grew rapidly in the following seasons and it was fortunate that the ACTCA commenced Sub-District competitions in 1975-76, just as the Club was facing the dilemma of how to cater for the older players who were soon to become ineligible to play in the Junior competitions. Two teams were entered in the new competition by the recently re--named Weston Creek Cricket Club. One team consisted of the previous seasons Under 16s, led by two of the fathers, while the other team consisted of cricketers keen to resume their involvement after a break of many seasons. Neither team achieved any great distinction on the cricket field but a tradition of off-field social activity was firmly established. By 1977-78, interest had increased as more Juniors graduated to the Senior ranks and four teams were entered in the various grades. The granting of a lease for Stirling Oval with its own small but adequate pavilion, was celebrated in 1977-78 with a special match between an Invitation XI and the Presidents XI which included Chris Cowdrey of Kent and England. This season also saw the first Senior success for the Club when the "B" Grade team, led by Ian Phillips, won the Grade Premiership. It was now evident that the real future and direction of the Club lay in obtaining full Grade status. 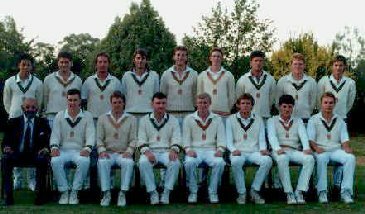 In 1978-79 WCCC and Ginninderra CC, from another developing area of Canberra, were invited to enter teams in the Third and Fourth Grades on a trial basis. Weston Creek also entered four more teams in the new City and Suburban Cricket Association and a women's team in the newly formed Womens Association competition - a total of seven Senior teams. After a successful orientation the Third Grade side reached the final - the Club was granted provisional First Grade status in the 1979-80 season. Since then the Club has entrenched itself as an integral part of the Weston Creek and indeed the whole ACT sporting community. The Club has always been an innovator thanks largely to the foresight, dedication and attention to detail of two people, Don Brooker and long-time Secretary Percy Samara Wickrama. The introduction of all weather artificial practice facilities and the annual Junior coaching schools stand out as examples. In 1982 the Club was the first in Canberra to invite an English professional player - Terry Davies of Glamorgan. Since then, with the assistance of generous sponsors, the Club has been fortunate to gain the services of John Abrahams (Lancashire) for three seasons; John Carr (Middlesex} for one season; and Stuart Fletcher (Yorkshire) for one season. All have made outstanding contributions both on and off the field. Another first in Canberra cricket was the publication of our Club magazine, "Cover Point", established in 1978. Five issues a season are published. More recently the Club has become the first in Canberra to employ, in conjunction with the Weston Creek Sports Club, a full time Groundsman. This should help us continue at the forefront of Canberra cricket for many seasons to come. The Club is extremely proud of several of its members. 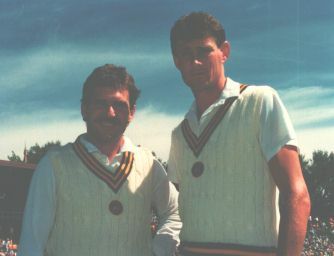 Greg Irvine, pictured here with Allan Border, was formerly the First Grade captain and captain of the ACT side. He was selected as Captain of the Australian Country team in 1986-87 and made the team again in 1987-88. He was the New South Wales Country Cricketer of the Year in 1986-87 and won the ACT Cricketer of the Year for the fourth time in 1990-91. He played for the Prime Ministers XI against New Zealand in December, 1987 - becoming the first local to do so and the first bowler to take 5 wickets in an innings of this annual one day fixture. Michael Bevan learnt his cricket with Weston Creek. An outstanding representative season for both the Under 19 and Senior ACT sides, in 1988-89, saw him win a place at the AIS Cricket Academy. He scored a century in his first class debut for South Australia and since moving to NSW he has shown himself to be the most exciting young talent in Australian cricket. Five centuries against five different States in five consecutive Sheffield Shield games in the 1990-91 season attest to that - a feat achieved by no one else. Huntley Armstrong, as an 18 year old, became the first ever member of the Club to be selected in a full Australian side. He played in the Australian Youth team, which won the inaugural World Youth Cup in Australia in January 1988. Season 1990-91 saw Huntley make his first class debut for South Australia. The determination and efforts of two people to arrange a tour to England finally came to fruition in 1985 and this appears to have created a Club tradition; a tour by Weston Creek CC every three years. A tall order, a lot of expense, an enormous amount of preparation but in the end a thoroughly worthwhile experience for those lucky enough to be a part of it and play cricket in England. The inaugural tour was in June 1985. Sixteen players, two managers and a 16 year old girl who was the Clubs scorer went on a four week ten match tour. Of the nineteen tourists only two had played cricket in England. So the party was expectant and full of enthusiasm to visit new places and to play the game in the land where cricket was born. The second tour was different. The Club already had over twenty players with English experience. They had been there and done that. Obviously these players had had a very enjoyable time and the word had got around. The line up for the 1988 tour was much younger with a greater will to win. They were less interested in the historic places they visited; all they wanted was to play as much cricket as possible and to take in as much of the English hospitality. What they meant was the English beer. The 1988 tour itinerary took in eighteen games and under Chris Body's captaincy the team came back unbeaten. Both tours took in some of the prettiest parts of the English countryside; the Avon valley, the Cotswolds, the hills and dales of Lincolnshire and Yorkshire and the green valleys of North Wales. These were also tours to the Roman cities of Bath, Chester, York and of course the biggest Roman city of all, Londinium with its plethora of attractions. Interwoven through it all, were the games of cricket played on some of the most picturesque grounds in England against a variety of clubs and school teams. The camaraderie engendered in the tour parties travelling, living and playing together has enriched the lives of those who took part. When Laurie O'Mara walked out at Crowthorne to open the batting for Weston Creek in the match against the Old Wellingtonians, history was being made. This was the first occasion when Weston Creek players took part in a match for the Club against an English team in England. It was in August 1985 when one of the Weston Creek Cricket Club's dreams was finally realised as fifteen players, two managers and a scorer boarded a British Airways plane to start a four week, eleven match, tour of England. After commencing with a practice session at Lord's, the tourists played on some of England's most beautiful cricket fields ranging from county grounds to picturesque village greens. The inaugural tour took the party through London, Chester, Manchester, Cambridge, Norfolk, then back to London. Six matches were won and four lost and to everyone's great disappointment the match against a Lancashire XI at Old Trafford was washed out without a ball being bowled. In the end of the tour report, the then President and co-manager wrote: "Living, travelling and playing together for four weeks created a wonderfully friendly and positive environment where every one of us grew in character. If it is possible, I think I am enjoying my tour even more now, in contemplation, than I did while I was in England. I hope we decide to go again." Standing (L to R): Matthew Collins, Kelvin Brown, Graeme Drew, Eatnrnon Rooney, Paul Evans, Clive Jones, Dean Lovett, Mark Whatmore, Paul Barnforth, Colvin Kelaart. Seated (L to R): Paddy O'Brien, Greg Rouse, Percy Samara-Wickrama (Manager), John Waldron (Captain), Chris Body (Vice Captain), Don Brooker (Manager), Roger Lonie, Laurie O'mara, Cathy Phelan (Scorer). Standing (L to R):Doug Wesney, Scott Evans, Paul Palisi, Mick (jarre07, Tim Morris, Peter Seberry, Shelby Rainey, Matthew Hardy, Ewan Mackenzie. Seated (L to R): Dean Lovett, Wal Hall (Player-Manager), Paul Evans (vc), Chris Body (c), Percy Samara-Wickrama (Manager),Alex Simmons. Go again we did, in June 1988. Many players who had not been able to go on the first tour, inspired by tales of the fun of touring and of English hospitality were clammering for a second and longer tour. Because of its uniqueness, the first tour was always going to be a hard act to follow and the "Tours Organiser", Club Secretary, Percy Samara-Wickrama, planned a different and more ambitious itinerary. Who had heard of a Canberra club team being offered a fixture against MCC? That was to be the highlight of the five week tour, but the English rain had other ideas. During June and July 1988, the second touring team played several matches in London before travelling through Bath, the Cotswolds, Chester, York, Cambridge and East, Anglia winning all their sixteen matches except for two which were rained off. By now, the tours were becoming an important feature of the Club's programme and were regarded as providing opportunities for young club members to further their cricketing experiences and to prove themselves under different conditions. Planning of a major tour takes an enormous amount of time and effort and places a great strain on the Club's administration but, once again, player interest prompted the planning of a third tour. 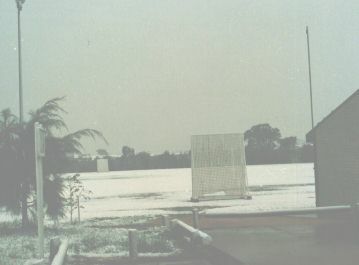 GAME 5 GAME 6 v. ADASTRAL & OLD BOTLEY CC at Jesus College Oval, Oxford, 4rh July 1988 - Match abandoned due to rain. 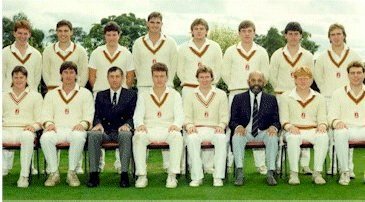 GAME 16 v. A CAMBRIDGE XI at Histon, Cambridgeshire 20th July 1988 (Cambridge won by 5 wickets) WCCC 1-220 (P.Evans 89, S. Evans 100*, S. Rainey 43*) CAMBRIDGE 5-293 (M.Garrety 63, Smallwood 90', D.Wesney 38', P.Palisi 3-53) GAME 17 v. SEVENOAKS VINE CC at Sevenoaks, Kent 28rd July 1988 Match abandoned due to rain. Standing (L to R): Rohan Samara-Wickrama, Peter Martin, Jon Dilena, Greg Seberry, Phil Shakespear, Sean Mowbray, David Hazell, Ewan Mackenzie, Chris Browning. Seated (L to R).' Percy Samara-Wickrama (Manager), Allan Taylor, Chris Body; Peter Seberry (vc), Roger Lonie (c), Chris Burgess, Scott Evans, Darrin Griffiths. As well, since the first tour, arrangements had been made for a number of Club players to spend a season with an English club during the Australian winter and the interest generated by this soon had players eager to form a third touring party. In 1991 an itinerary of eighteen games played over five weeks was arranged and, guided by past experience, a better balance between travelling and playing was achieved. Six major centres were used commencing at Bath, moving then to Chester, York, Nottingham, Norwich and on to London. In terms of playing results, this was perhaps the least successful of the tours with six games won, two drawn and four affected by rain but, in general terms, it was again a highly successful and rewarding experience for the tourists.